Dr. John Moore grew up locally in O’Fallon, MO. He received his doctorate degree at Logan University after receiving his degree in biology from Saint Louis University. During his time at SLU, he excelled at ice hockey, playing 4 years on the Ice Hockey Team. During his time at Logan University, Dr. Moore was president of the Motion Palpation Institute club (MPI), where he learned to not only teach a dynamic assessment for joint dysfunction of the spine and extremities, but also manipulations for each of the corresponding joint dysfunctions. Dr. Moore utilizes this dynamic approach in his practice along with incorporating the appropriate corrective exercises to improve patient’s movement dysfunction. He also utilizes developmental kinesiology to provide the correct exercises to correct dysfunction in the body. 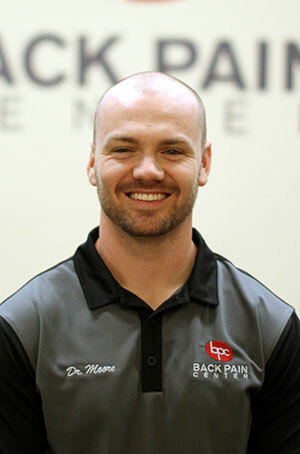 His main objective is to improve patient’s overall movement, because the prerequisite for living an active pain free life is the ability to first move well! Dr. Moore has a love for St. Louis sports, and enjoys playing golf, softball, and hockey. More than anything, he values spending time with his beautiful wife Katherine and their dog Charlotte.